What happens when a lead replies to your text? What happens will depend on If you choose to recieve replies via email and or have them forwarded to your cell phone number associated with your account. You can change these reply settings on the “My Billing” page. Please note that we deduct a credit from your available texting credits for every text reply we forward to your cell phone number. How Reply Forwarding Works To Your Personal Cell Phone? The platform will instantly forward any replies to your sent text messages to your personal cell phone. They will appear as a normal text message in your cell phones native texting application. 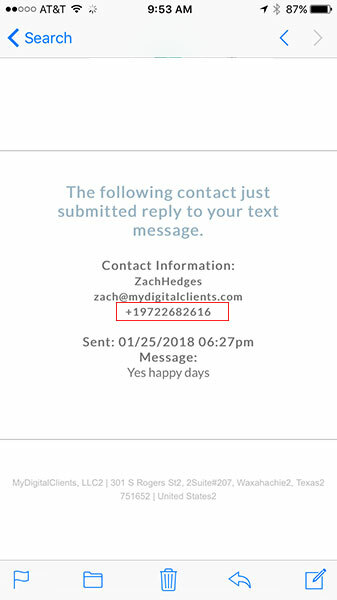 On your cell phone the message thread will show your account’s Long Phone Number you setup with our platform as the contact sending you the message. In this message thread assigned to your Long Number is were we forward all replies from all your contacts to your cell phone. You can track which replies belong to which lead by the phone number next to the message in the thread. DO NOT REPLY BACK TO YOUR LEAD VIA THIS MESSAGE THREAD. 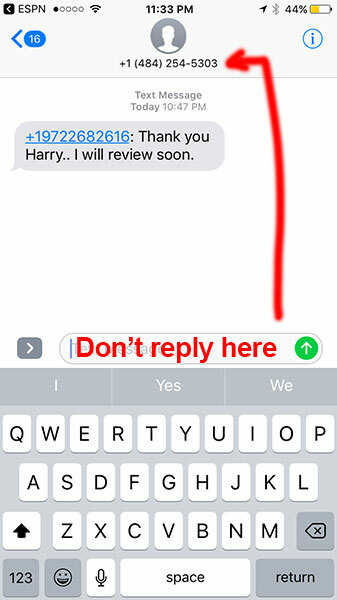 The lead will never get your response because you are sending that response to your accounts Long Phone Number not the leads cell phone number shown in the box above. If you do this your response will just be forwarded right back to you. How do you reply back to your leads text messages? 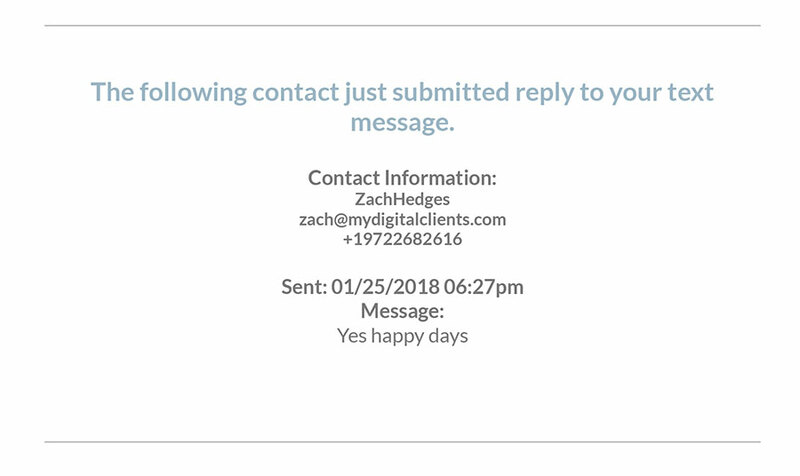 There are two ways to reply back to your leads message. Option#1 – Outside off the platform using your personal cell phone. 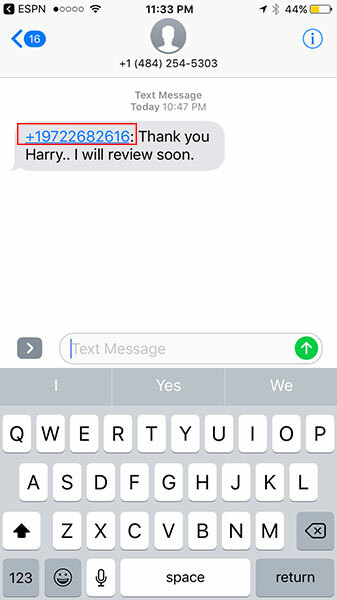 Using this method does not cost you any of your text credits to send or recieve further texts from your lead, since you are using your personal cell phone number to communicate. Using this method means you are taking the conversation outside of our application, which means any communications you have will not be tracked in our app under the leads “Text Message History”. 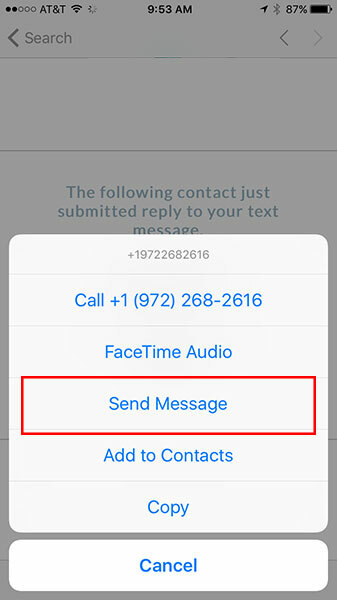 Step#1 – To do this method just click or press down (on Iphone) the phone number next to the leads message to you in the thread from your Long phone number. Pick the option to send a message to that number. This will create a new message thread to your lead using your cell phones texting app so you can reply via that app. Please note you will be exposing your personal cell phone number to the lead if you respond to them using this method. Option#2 – Within the platform. Using this method does cost you text credits to send or recieve further texts from your lead. Using this method does not expose your cell phone number to the lead. Using this method means we can track all messages in our app under the leads “Text Message History”. Step#1 – To do this method just login to your account via your desktop or cellphone web browser. Once you are logged in go to the “All Contacts” page and find the lead, then click their name or “Eye” icon to pull up their lead profile. Once you are in the lead profile page open the section called “Text Message History”. In this section you will find all of the text messages sent and replies for that lead. Reply back to the lead right from the history section. How Email Alert Replies Work? The platform will forward any replies from your lead via an email alert to your account email on file. Reply email alerts are sent every 15 minutes and are not in real-time. How do you reply back to your leads text messages via an email alert? Step#1 – To do this method open the email on your cell phone using your email client, just click or press down (on Iphone) the phone number next to the leads information in the email sent to you. Pick the option to send a message to that number. This will create a new message thread to your lead using your cell phones texting app so you can reply via that app. Please note you will be exposing your personal cell phone number to the lead if you respond to them using this method.